A full-service dental office, providing complete family dentistry to the people northern New Jersey since 1984. Steven Blaustein, D.M.D. has been practicing dentistry in Edgewater since 1984. 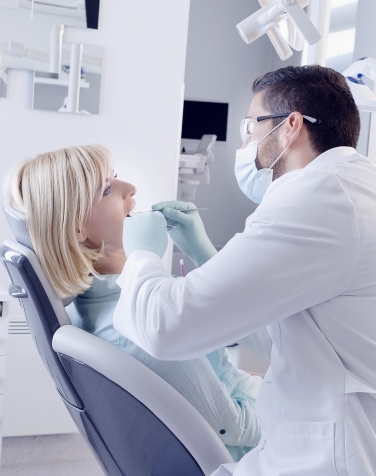 Cleanings, extractions, fillings, crowns, implants, dentures, & more. Bleaching, bonding, veneers, inlays & onlays. Essential dental care, plaque & tartar control, sensitive teeth, and more. Have a question or concern? Submit your inquiry to Dr. Blaustein. Edgewater Dental’s calm, relaxed atmosphere and friendly staff will put you right at ease. We offer stereo headphones, movies, PlayStation for children, and Internet access for our patients. One of our highest priorities has always been infection control and the maintenance of a sterile environment. We use distilled water with medical filters for all dental treatments - as well as for the cleaning and sterilization of all dental instruments. We have been providing complete family dentistry to the people of Edgewater and northern New Jersey since 1984. Dr. Blaustein’s general practice encompasses preventative dentistry, prosthetic dentistry, sports dentistry, trauma dentistry, restorative dentistry, endodontics, and treatment of TMJ disease. Dr. Blaustein strives to employ the most up-to-date techniques to help you attain the smile you’ve always wanted. The contour, color, and alignment of your teeth can be improved with various techniques. Professional bleaching lightens discoloration for a brighter smile. Learn about our techniques. Bonding & veneers restore chipped, cracked, discolored, or misaligned teeth. Tooth-colored restorations used on the chewing surfaces of the back teeth.